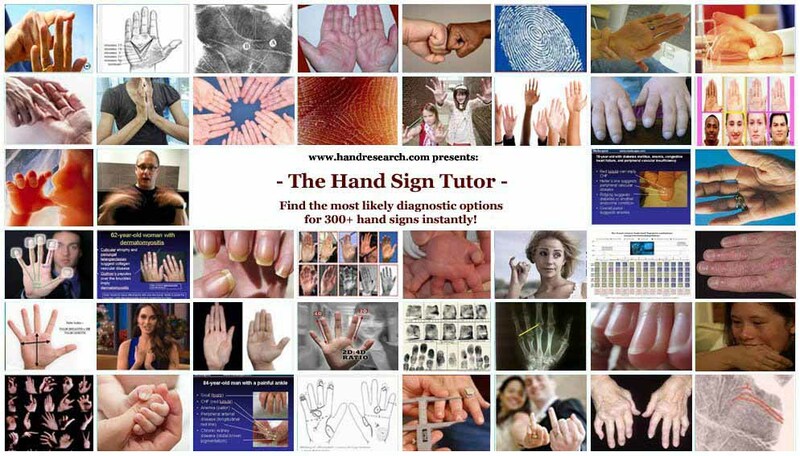 Hand Reading Signs: explore 300+ Hand Signs via 9 Levels of the Hand! Beyond the concept of Multi-Perspective Hand Reading one can explore the significance of specific hand signs. An overview of many fascinating hand signs is presented below - you might also use the HandResearch.com search tool (at the homepage) or use the brand new Hand Sign Tutor in order to find more info about these hand signs + info about many other hand signs! a solid assessment always requires a consideration of hand sign combinations!" options for 300+ hand signs instantly! levels in Multi-Perspective Hand Reading! The following behavior related hand signs are listed above: behaviors, flapping, handedness, hand behaviors, hand flapping, left handedness & wagging. Many of these hand behavior signs are described inside the article: Hand Behaviors in Mental Disorders! The following motoric hand signs are listed above: motor tics, reflexes & tremors. Many of these hand behavior signs are described inside the article: Primitive Reflexes of the Hand! The following hand shape issues are listed above: air hand shape, earth hand shape, elemental hand shape, fire hand shape, quadrants & water hand shape. Many of these hand shape signs are described inside the article: Hand Shape Assessment 2.0! The following signs involving palm shape are listed above: hypothenar, long palm, mars, (positive) metacarpal sign, moon, short palm, thenar, ulnar border straight, venus & zones. The following issues related to finger shape are listed above: apollo, digit ratio (2d:4d), ectrodactyly, finger length, index finger, jupiter, mercurius, middle finger, pinky finger, preacher's sign, ring finger, sun & thumb. More news reports involving the fundamentals of fingers & related ratio are presented inside the sections: Thumbs & Finger News & 2D:4D Digit Ratio News. The following issues involving skin quality are listed above: cold hands & tripe palms. Many fascinating news reports related to the skin of the hand (beyond dermatoglyphics) are presented in the section: Hand news: hand, skin & hair reports! The following fingernail signs are listed above: Beau lines, clubbing, growth, koilonychia, leukonychia, lunula / nail moon, onycholysis, onychomycosis, paronychia, pitting, ridges, spoon nails & yellow nails. The diagnostic significance involving over 57+ nail signs is described by detail inside the Nail Tutor! The following dermatoglyphic hand signs are listed above: arches, AtD-angle, fingerprints, hypothenar whorl, loops, radial loops, ridge count, ulnar loops & whorls. Fingerprints & Dermatoglyphics: Diagnostics beyond Identity! The following hand line signs are listed above: creases, distal transverse crease, head line, heart line, life line, mars line, palmar creases, proximal transverse crease, simian line, stars & Sydney line. The 3 Primary Hand Lines! in order to find even more hand signs, hand signals & hand markers!